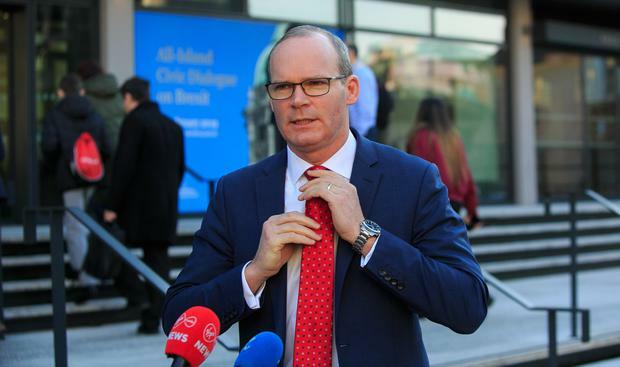 Ireland is spending “hundreds of millions of euros” on preparing for a no-deal Brexit, which would be a “crazy outcome” of three years of EU-UK negotiations, Tánaiste Simon Coveney has said. Coveney said the European Union wanted to find ways to help UK parliamentary ratification of the Brexit deal but that the lawmakers’ asks needed to be “reasonable”. “We want to find ways of providing the reassurance and clarification the British Prime Minister needs to be able to sell that deal in Westminster. But that doesn’t involve reopening that withdrawal agreement,” he said. “What we can’t do is essentially remove or change the guarantee and the insurance… that prevents border infrastructure in the future and replace it with something that is wishful thinking,” he said of the so-called Irish border “backstop” part of the stalled deal that is bitterly contested in the UK parliament. He said Ireland and the EU would not accept a fixed time-limit on the backstop either as that would kill the purpose of the insurance policy. But he reiterated the EU’s readiness to change the political declaration on future ties with Britain – which makes part of the Brexit package together with the legal divorce treaty – to include more assurances of clarifications on the backstop there. “We have a deal, it was negotiated. And now we need to find a way of getting it ratified,” he said of the EU-UK sealed by Prime Minister Theresa May last November.